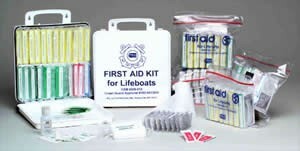 Our "Lifeboat" First Aid Kit complies with Coast Guard regulations for water safety first aid kits (USCG Code of Federal Regulation,title 46, Part 160, subpart 160.041). 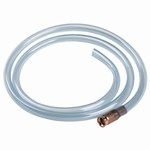 Ideal for commercial, pleasure or sport boats. A complete variety of first aid supplies( multiple quantities of 14 different items), all shrink wrapped and poly bagged for waster resistance. Kit packed in water resistant plastic case with carry handle.11" X 9" X 5". Complete kit refills available separately. Plastic strip bandages, compresses, ammonia inhalants, triangular bandage with pins, wire splint, asparin, burn cream, eye dressing, Iodine wipes, tourniquet and First Aid Fact Sheet. .